We don’t know many people who actually enjoy doing their taxes. But if you’re the owner of a business, an accounting professional, or self-employed, 1099 preparation is a big deal. OnlineFileTaxes.com is proud to be an IRS-approved e-file provider. 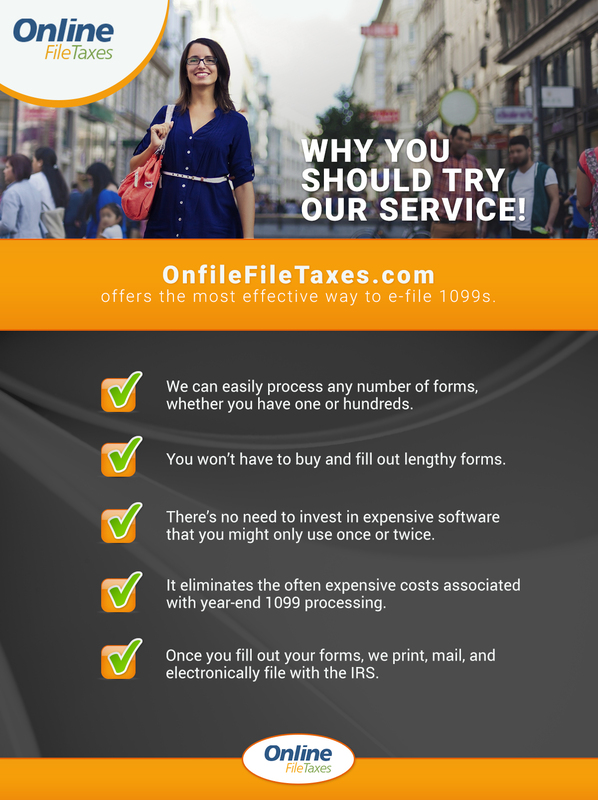 We take the hassle out of filing your 1099 forms. With our online tax reporting service, you can e-file 1099 forms and other documentation in minutes. Say goodbye to wasting valuable business days manually going through one 1099 after another. With OnlineFileTaxes.com, your files are electronically sent to the Internal Revenue Service quickly and efficiently. For your convenience, we also print and mail recipient copies for you to keep in your records. Keep reading to learn more about our service and how OnlineFileTaxes.com makes sense for your situation. Whether you have just one copy of a 1099 form to file or hundreds, we invite you to take advantage of our services. So what makes OnlineFileTaxes.com unique? Well, let’s start with the fact that our do-it-yourself software allows you to effectively manage all of those tax forms. Plus, since we e-file 1099 forms, a 1096 isn’t necessary. As long as you get your completed documentation in by the end of March, then it will be filed on time. Pretty cool, right? E-file only – Maybe you have already provided us with recipient copies and simply want us to report to the IRS. If that’s the case, then this is the option for you. Print and mail only – Some businesses and individuals prefer that we print and mail recipient copies. For example, let’s say you already submitted your information to the IRS but would like OnlineFileTaxes.com to provide hard copies to recipients. You can count on us to customize a solution to fit your needs. TIN checking – Should you report a wrong TIN number for your recipients, you could face serious penalties. OnlineFileTaxes.com can help you be proactive in this area. It’s important to know that we are an IRS-approved TIN check provider. If you’re interested in this service, we will confirm the number before submitting to the IRS. Please don’t hesitate to reach out to us with questions regarding TIN checking. OnlineFileTaxes.com will e-file your 1099 forms for as low as $1.25 per form. Frankly, if you’re looking to save time and money on your taxes, choosing OnlineFileTaxes.com is a no-brainer. Take it from Jennifer Schubert-Akin of Manhattan Accounting Services, LLC in Colorado, who says, “I highly recommend OnlineFileTaxes for your 1099 e-filing needs. There’s no need to buy expensive forms and stuff envelopes. It’s secure, accurate, fast, and affordable…and better than Intuit’s e-file service. It’s time to take control of your taxes. Start filing today. This entry was posted in File 1099 and tagged 1099 online, 1099 preparation, copy of 1099 form, efile 1099 forms on June 28, 2018 by OFT.